مدیریت پایدار حیات وحش و زیستگاه‌های طبیعی برآیندی از مجموعه بررسی‌ها و مطالعات مکانی، کمی و کیفی مرتبط با جمعیت‌های حیات وحش و زیستگاه‌ها می‌باشد. امری که لزوم توجه به نگهداری صحیح از داده‌های موجود و ساماندهی آنها جهت افزایش عمر مفید این گونه داده‌ها به منظور جلوگیری از تکرار عملیات تهیه و جمع ‌آوری آن‌‌ها و به تبع آن هدررفت بودجه‌های حفاظت و مدیریت حیات وحش را ضروری می نماید.لذا در پژوهش حاضر با توجه به مزایای بهره گیری از سیستم مدیریت پایگاه داده در نگهداری، استفاده و مدیریت داده‌ها، طراحی و پیاده‌سازی یک نمونه پایگاه داده مکانی حیات‌وحش در استان خوزستان صورت می‌گیرد. در طراحی و پیاده‌سازی پایگاه داده هدف، از پایگاه داده شیء-رابطه‌ایPostgreSQL/PostGIS استفاده شد. بر اساس یافته‌های این پژوهش، پایگاه داده متن باز PostgreSQL/PostGISبه عنوان یک گزینه مناسب جهت توسعه قابلیت‌های مدیریت داده‌های مکانی حیات وحش شناخته شد. همچنین مشخص شد که سیستم طراحی شده قادر به پشتیبانی از کلیه پرسش‌های ممکن مرتبط با داده‌های مکانی حیات وحش بوده، راه حلی جهت رفع برخی مسائل و مشکلات مربوط به مدیریت حجم عظیمی از داده‌های پراکنده حیات وحش ارائه می‌نماید. همچنین با توجه به موفقیت‌آمیز بودن پژوهش حاضر، ضرورت توجه به ساماندهی و مدیریت اطلاعات حیات‌وحش کشور و گنجاندن آن در متن سیاست‌های کلان سازمان حفاظت محیط زیست کشور مورد تأکید قرار گرفته، ضرورت ایجاد و توسعه پایگاه داده مکانی جامع حیات وحش کشور خاطر نشان می‌شود. Sustainable management of wildlife and natural habitats is an outcome of a series of spatial, quantitative and qualitative surveys and studies related to wildlife populations and habitat populations, a matter which necessitates to pay attention to the proper maintenance of existing data and to organize them to increase the useful life of such data in order to avoid repeating the operations of data acquisition and collection, and consequently to avoid the loss of funds for conservation and management of wildlife. Therefore. In the present study, considering the advantages of using database management system for maintenance, use and management of data, the design and implementation of a wildlife spatial database sample in Khuzestan province is carried out. In the design and implementation of the target database, the PostgreSQL / PostGIS object-relational database was used. According to the findings of the study, the PostgreSQL / PostGIS open source database management system was identified as an appropriate option for the development of the spatial data management capabilities of wildlife. It was also found that the designed system was able to support all possible questions related to wildlife spatial data, providing a solution to some issues and problems related to the management of a huge amount of wildlife scattered data. Also, due to the success of the present research, the necessity of focusing on the organization and management of wildlife information in the country and its inclusion in the context of the policy of the Environmental Protection Agency of the nation has been emphasized, and the need for the creation and development of a comprehensive spatial database of the wildlife of is pointed out. 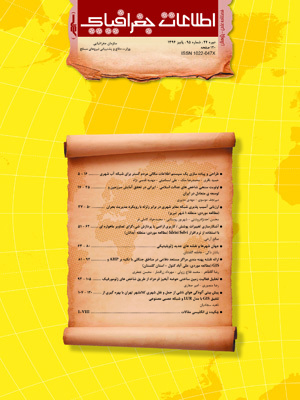 1- آل‌شیخ، دوج؛ علی اصغر و سمیه، 1385، نشریه دانشکده فنی، 40 (8): 1055-1045. 2- آیت، فراهی؛ ناصر و احمد، 1386، پایگاه داده‌ها، انتشارات دانشگاه پیام نور. 3- حسینیان، عبادی، فرنود احمدی؛ سحر، حمید و فرشید، 1386، ارزیابی تلفیق سیستم‌های مدیریت پایگاه داده مکانی با سیستم‌های فتوگرامتری و کاربرد آن در مدیریت شهری، مجموعه مقالات سومین کنفرانس بین‌المللی فناوری اطلاعات و دانش. 4- سالنامه آماری استان خوزستان، 1392، سازمان مدیریت و برنامه‌ریزی استان خوزستان. 5- سلمان ماهینی، عبدالرسول. 1388، شالوده حفاظت محیط‌زیست. راه دانش سبز ، ص 337. 6- نبوی، بهروزی راد، پاداش؛ محمدباقر، بهروز و امین، 1389، اطلس پراکنش پرندگان و پستانداران استان خوزستان، سازمان حفاظت محیط‌زیست، اداره کل حفاظت محیط‌زیست خوزستان، چاپ اول، تهران. 7- نیشابوری، علی اصغر، 1385، اکولوژی عمومی، انتشارات دانشگاه پیام نور، چاپ چهارم، تهران. 8- Anderson, Mark C. Watts, Joseph M. Freilich, Jerome E. Yool, Stephen R. Wakefield, Gery I. McCauley, John F.&Fahnestock, Peter B. 2004, Regression- tree modeling of desert tortoise habitat in the central Mojave desert, Ecological Applications, 10(3): 890-900. 9- Cagnacci, Francesca&Urbano, Ferdinando. 2008. Managing wildlife: A spatial information system for GPS collars data, Environmental Modelling and Software 23: 957-959. 10- Davidson Sarah Cain. 2014. A bigger picture: data standards, interoperability and data sharing. In Spatial database for GPS wildlife tracking data. Edited by Urbano Ferdinando& Cagnacci Francesca: Springer International Publishing: Switzerland; 245–270. 11- Dwyer, Ross G. Brooking, Charles. Brimblecombe, Wilfred. Campbell, Hamish A. Hunter,Jane. Watts, Matthew& Franklin, Craig E. 2015, An open Web-based system for the analysis and sharing of animal tracking data, Animal Biotelemetry, 3(1):1-11. 12- Greenwald, Rick. Stackowiak, Robert& Stern, Jonathan. 2008. Oracle Essentials, Oracle Database, 11g: 4th Edition. 1-386. 13- Harris Larry D. 1984. The fragmented forest: island biogeography theory and the preservation of biotic diversity. University of Chicago Press, Chicago. pp: 1-230. 14- Huettmann Falk. 2005. Databases and science-based management in the context of wildlife and habitat: toward a certified ISO standard for objective decision-making for the global community by using the internet. Wildlife Management, 69: 466–72. 15- Lynch-Stewart Pauline. 2004. Environmental assessment best practice guide for wildlife at Risk in Canada. Canadian Wildlife Service Environment Canada, pp: 1-63. 16- Ottaviani, Daniela. Lasinio, Giovanna Jona& Boitani, Luigi. 2004. Two statistical methods to validate habitat suitability models using presence data, Ecological modeling, 179(4): 417–443. 17- PostGIS: Refractions Research Inc.; 2007. http:// postgis.refractions.net/. 18- PostgreSQL: The PostgreSQL Global Development Group. 2006. http://www.postgresql.org/. 19- Spear, Ronald L. 1992. A Relational/Object-Oriented Database Management System: R/OODBMS, Department of Computer Science, NAVAL POSTGRADUATE SCHOOL, 1-225. 20- United Nations, 1992, Convention on Biological Diversity. pp: 1-28.